An OK saison. Pretty musty, heavy, plenty of alcohol. Not the best I've ever had, but I'm not sorry I had one. Thanks Owen! The pic is pretty fuzzy, I'm still working on this, and I forgot to color in the rating. I would give this one five beers. Brown ales originate in England. The original brown ale style is made from 100% brown malt. 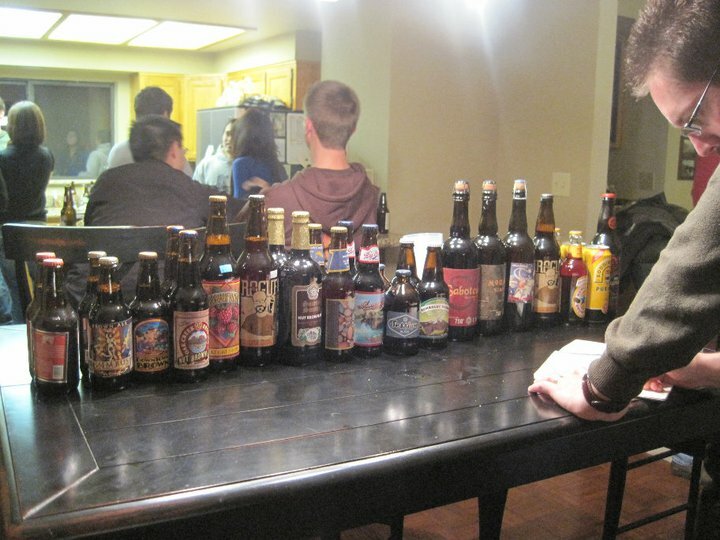 There is some difference between American brown ales [Type 33] and English brown ales [Type 47], with the American styles tending to be drier and hoppier. Although labeled by New Belgium as a Sour Brown, this beer is very much like the Flanders Red [Type 28], a sour, fruity beer. Nearly everyone did not like this beer, but I loved it. The intense sourness coated your tongue with an aftertaste of vinegar and sour cherries. A very unusual beer. 1 beer/6 beers. 6.0% ABV. Not a brown ale, but an English Pale Ale, we used this to cleanse our palates after the Flanders Red. Newcastle is one of the most widely distributed English Brown Ales. 4.7% ABV. A lighter brown ale, Newcastle is a sweet malty beer, easily drinkable and easy to find too. 3 beers. The Magistra's favorite of the moment. Rogue's Hazelnut Brown is an intensely full, nutty beer. It has tastes of chocolate that make it taste like Rocky Road ice cream. Our host favored this beer as well. 6.2% ABV. 1 beer. This beer tasted like apples and malt. Very thick, much like a barleywine. This is a Belgian dark ale [Type 29]. 9.5% ABV. 1 beer. A host favorite. Sweet and foamy with an intense burst of flavor as it hits your tongue. 8.5% ABV. Pretty expensive for the taste. 3 beers. Aged in oak barrels, this beer tastes like Kentucky bourbon. Not as popular due to the oakiness, but it has a sweet finish like pineapples. 3 beers. 10.0% ABV. A hippie beer brewed with hemp. This actually isn't that unusual, because hops are a member of the Cannabaceae family anyway. 5.7% ABV. Good flavor, but nothing special. 3 beers. 5.0% ABV. Another host favorite. Lineup PintThe pale ale isn't necessarily pale, it is called so in distinction with the porter, the other common style in England. The use of malts with less color makes the pale ale less dark than a porter, but usually darker than a pilsner. As an ale, they are made with top-fermenting yeast. The style originated in Burton-upon-Trent, a city known for its hard water. The preeminent pale ale from Burton-upon-Trent is Bass. The minerals in the water gave the beer its flavor, and later a process known as Burtonization was developed to allow for the same flavors in beer brewed in other locations. An American Pale Ale [Type 17], which tends to be maltier and much hoppier than the English Pale Ales, Oak Creek Pale Ale is amber colored, with a significant piney hop taste. 5.5% ABV. 3 beers. Dark orange, and a little hazy. Has a sour, Belgian finish. Surprisingly sweet for a pale ale. 6.2% ABV. 4 beers. This is my favorite of the bunch. It is an old school English Pale Ale [Type 10], more like a porter because of the cocoa flavors from the malt. Very drinkable beer. 5.0% ABV, 2 beers. A California beer, it is strong on the hops, with a smell like stale beer. 5.5% ABV, 5 beers. An Arizona classic, 8th Street Ale is the flagship brew from Four Peaks. It is citrusy, something I had never noticed before. As a milder Pale Ale, it is considered an English [Type 10]. It has a bit of a soapy finish. 4.5% ABV, 3 beers. 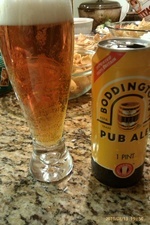 Boddington's Pub AleA traditional pub ale, Boddington's is clear and smooth, the kind of beer you can just keep on drinking all day. We had the can with the nitrogen capsule, so it had a nice creamy head on it. Light in color and flavor, goes down easy. 4.7% ABV, 2 beers. A bit of a blended style, Ballast Point Yellowtail is an ale that is lagered. It is a Kölsch [Type 55] more than a pale ale, but they label it as the latter. Very sweet, I don't think I could drink too many. 4.6% ABV, 5 beers. I couldn't really taste the juniper, but that may not be the beer's fault at this point in the evening. 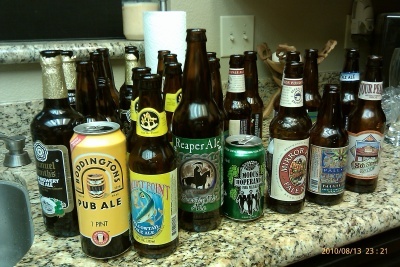 A couple of IPAs snuck in at the end, which is okay since in this part of the queue you aren't all that selective anymore, and the IPA hops cannot affect the more delicate flavors of the earlier beers. I reviewed Two Hearted Ale in January of 2010. OMG! That is hoppy! This is a quote, and everyone insisted I write down what I said, so there it is. Modus Hoperandi is one of those punch you in the face kinds of IPAs. It has an intense hop aroma and equally intense flavor. 6.8% ABV, 4 beers.